No matter what industry you are in, you can find tweets from people who are likely to be interested in your products and services. If your business is about dog training you can find people tweeting about their dogs potty training, or chewing up their shoes. A dentist can find people complaining about mouth problems, everyone should be able to find something. The important part is knowing what to look for in your industry, and finding it without spending several hours a day looking. Enter TweetWally. Before I found TweetWally I was using a few different tools to search for keywords that had to do with my industry, but I would see several posts that didn’t have anything to do with the people I was looking for. 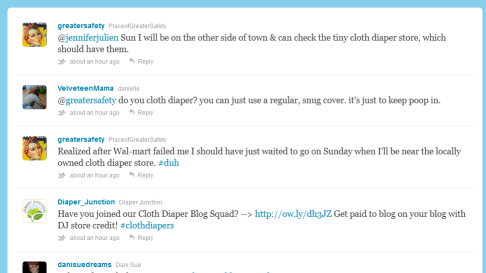 My example niche is cloth diapers, I use this industry all of the time for an example. What I was looking for was people that would be interested in a blog. I wanted to follow them, answer questions they posted, and introduce myself and my blog. This isn’t for sending out promotions, remember social media is about RELATIONSHIPS, not seeking out someone who is interested in your product and drilling them for the sale. You can learn more about this idea in Likeable by Dave Kerpen, it’s a great book. Enter a keyword, hashtag or username to search for. Let’s focus on a keyword for now, because hashtags and usernames require a bit of a different strategy we will cover in a future post. 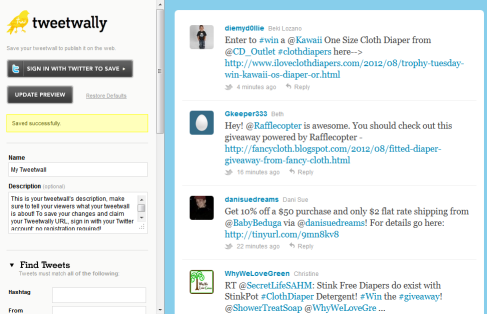 Your keyword will be something that will be part of the tweets, a dentist would look for teeth as a keyword. Plural keywords are different so keep this in mind. 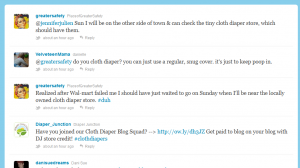 This helps me get real results that I can actually use to connect with people who are interested in cloth diapers. Check the graphics to see what I mean about the results. To connect with the people I go follow them, and send a tweet mentioning them (send a tweet with @theirusername in the tweet) saying. To get the most out of your Tweetwally you should visit a few times a day, because it will only cover the latest 25 posts. Your target market (the people you want to chat with about your business) will be on all different times of the day, so by checking several times a day you will encounter a variety of people. Every week or so you may want to edit your TweetWally to add keywords, hashtags, and usernames to include other words people will be discussing, for instance, a dentist might also want to follow toothpaste. There are quite a few ways you can use TweetWally if you get creative, as I come up with more ideas, I’ll put them in a post. If you need any help choosing keywords or anything let me know below. © 2012 – 2015, Social Media Consultant. All rights reserved.